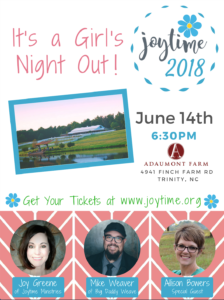 Joytime 2018 will be a night of encouragement filled with solid Biblical teaching from Joy Greene (of Joytime Ministries) and inspiring Christian music from Mike Weaver (of Big Daddy Weave)! Grab your girlfriends and make plans to come! father, and lead singer of Big Daddy Weave. Big Daddy Weave, known for their songs “Redeemed,” “My Story,” “The Lion and The Lamb,” “The Only Name (Yours Will Be)” and many more, have now been appearing across the country for over nineteen years. Mike will share stories and songs at Joytime 2018. Mike has been ministering with Joy Greene of Joytime Ministries for many years. They have served together in a variety of settings, but mostly at events that encourage women in their walk with God. Mike and Joy share the same passion for serving and worshipping Jesus and their events speak into the hearts of those who attend. Allison is our special guest for Joytime 2018. She is a North Carolina girl who has always had a song in her heart! She has a powerful voice and loves to praise Jesus. You will be blessed to hear Allison as she opens Joytime 2018 through song! I just saw this and am soooooo excited!!! This barn venue is out of this world! I cannot wait!!!! !